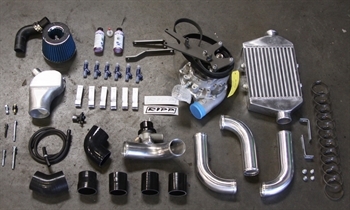 Ripp 2007-2011 GEN2 Jeep Wrangler JK Supercharger Kit Stage 2 Intercooler RIPP Supercharger Systems for the 2007-2011 Jeep Wrangler JK featuring Vortech's newest self contained supercharger, the V-3 Si-Trim. Enjoy enormous power gains with factory smooth delivery with one bolt on. This supercharger system bolts on 100+ additional wheel horsepower on a 100% check engine light free environment. •RIPP Supercharger kits install in 6 hours •Kits come pre-tuned with a state of the art flash unit supported world wide •Come with a self contained supercharger ready for 600hp •Are infinitely expandable with throttle body and headers •Stage 2 Supercharged V6's produce 200+whp and 240ft/lbs of TQ (35" tires) Initial testing has found that in stock form the 3.8l only produces as little as 133 Wheel Horse Power (WHP) on stock wheels/tires and gears and as little as 108-123whp on up rated 35" tires. With the addition of a RIPP Supercharger and running through stock exhaust manifolds, cats and exhaust, the3.8l produces 240-/+ Rear Wheel HP (WHP) on stock wheels/tires and gears at 8psi. More over an impressive 220+whp and 230+lb/ft of torque on commonly used 35" wheels and tires. (HP levels vary depending on tire and gear combination as rotational mass comes into play, this effects both Naturally Aspirated (NA) and Forced Induction (FI) total output).